GPL Tournament Returns This Month for 10th Anniversary EventOn and off the field, the International Gay Polo Tournament, hosted by the Gay Polo League in Wellington, keeps getting bigger and better, and the upcoming 10th anniversary celebration is maintaining that tradition.GPL founder Chip McKenney had a vision, and it has given way to something unique. This year’s four-day extravaganza is highlighted by the return of the festive “GPL Polotini Presents Wigstock!,” an over-the-top pre-party for a purpose on Friday, April 5 at the members-only Mallet Grill at International Polo Club Palm Beach, followed by tournament games featuring the coveted Senator’s Cup and the famed tailgate competition on Saturday, April 6 at IPC’s Isla Carroll field. Several professional polo players, including Joey Casey, Charlie Muldoon, Sugar Erskine and Tiffany Busch, donate their time and skills, quarterbacking the teams. “Through their involvement, these professional players give the GPL tournament a legitimacy of sport, and their participation helps to elevate awareness of the GPL tournament to the global polo community,” McKenney said. Casey, who owns the Palm City Polo Club in Boynton Beach, was instrumental in helping McKenney get the event going. “I read about the GPL and reached out to Chip 10 years ago and brought them to Florida,” said Casey, a fourth-generation polo player. In that article, McKenney expressed a goal to one day bring the GPL to Wellington because it is the epicenter of polo in North America. Former 6-goaler Muldoon helped Casey run a polo clinic for GPL players, and that’s where he met McKenney. Muldoon said the level of polo has progressed because the original group has improved so much due to Casey’s coaching, as well as the addition of so many new international GPL players. McKenney began playing polo in 2006 after retiring from show jumping. Schedule permitting, he practices and plays polo three times a week at the Palm City Polo Club. When he began, he only played arena polo. Now he primarily plays on the grass in 6-goal tournaments and an occasional 10-goal tournament. While the action on the field has improved, it is the colorful sideline activities that provides the flair of the event. Every year brings a new layer of quality to the event, McKenney added, who explained that the biggest difference between the first year and now is the level of play. Every year, the GPL chooses a charity partner. This year, the not-for-profit partner is Sage, the nation’s oldest and largest organization dedicated to serving and advocating for lesbian, gay, bisexual and transgender seniors. “It is a great feeling to be able to use our event to raise awareness and much-needed funds for an organization that provides services to a segment of our community that is often overlooked, underserved and relatively invisible,” McKenney said. 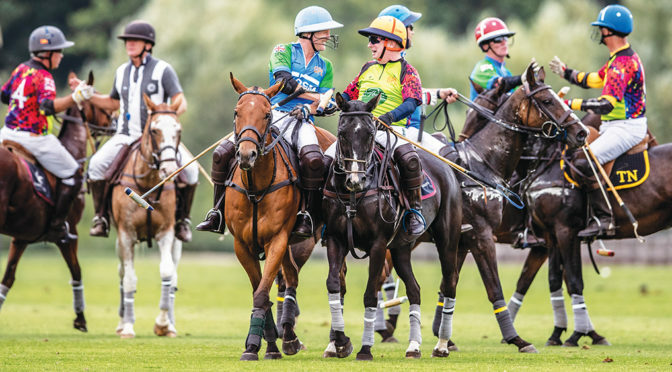 From the beginning, the tournament was a team effort, with dozens of volunteers and committees organizing the biggest party of the polo season. Tickets for the 10th annual International Gay Polo Tournament and its festivities are currently on sale at www.gaypolo.com/tickets.